Suri Futures ananounces that Bruxo has finally passed on. He lives in the next world, and his body remains with his harem at our farm in Cave Junction, Oregon. 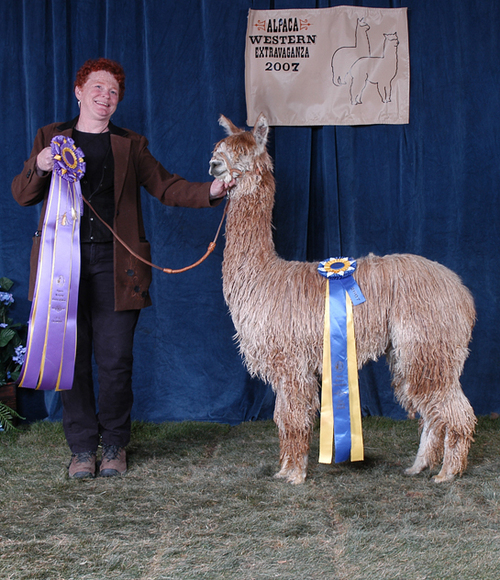 Bruxo's genetics continue to improve the North American suri alpaca industry. Bruxo's genes are the greatness behind the famous Macgyver, the most celebrated Herdsire of the Year, as well as Helios, Luxor, and many other champion suris. 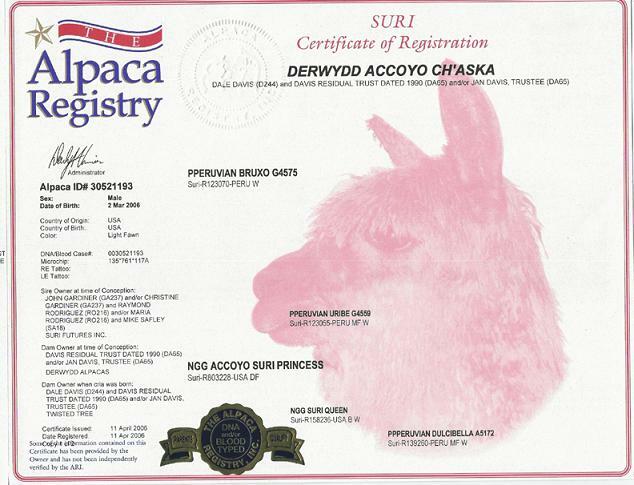 He was a homozygous Accoyo suri and an outstanding impact herd sire, with 156 suri cria and no H's. An impact stud throws cria that look like him more than the dam and carry his fiber and conformation traits. Bruxo's offspring all exhibit extraordinary luster, fineness, fiber uniformity and of course great conformation and perfect bite. His phenomenal fiber statistics should get the attention of anyone breeding for fine suri fiber - especially for a breeding male of his age. This is the high quality suri fleece we should all be breeding for! IAO 2011 - Sire of the Supreme Champion Fleece Suri! 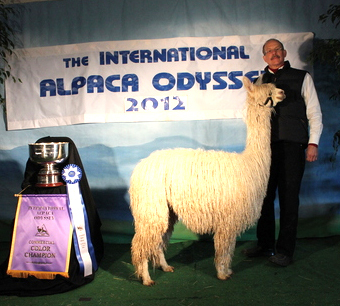 IAO 2010 - WINNER of the Supreme Champion Fleece Suri!! He killed em at IAO! 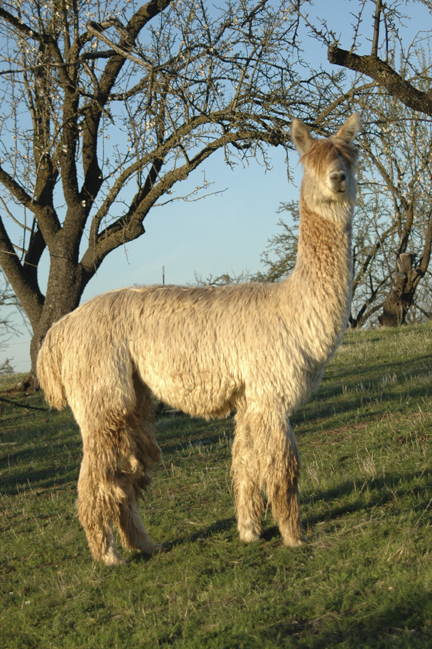 We are absolutely certain that Chaska will become one of California’s famous Accoyo Macho’s - producing fine fibered, locked to the skin & VERY lustrous, solid boned crias. Overall this male is excellent! He is a strong male with excellent substance of bone. Perfect Bite. Luster to burn. Locked to the skin in his first fleece AND his second fleece(he won 2 of his 7 championship in his SECOND fleece AND SUPREME FLEECE IAO in his THIRD fleece) He is true to type thru his head and overall proportions, exhibiting fineness, LUSTER, uniformity of character throughout the blanket and excellent density for fineness (see his 08 skin biopsy below!) We expect his progeny to exhibit the same excellent characteristics. 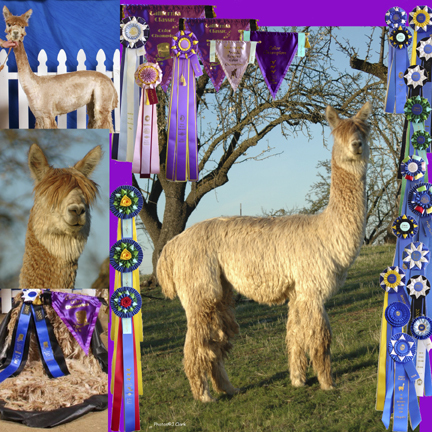 Chaska’s dam, Accoyo Suri Princess has produced champion cria after champion cria (5). His sire Bruxo has had the same impact on the American Suri Herd that Caligula has had on the American Huacaya herd – one only has to observe their sons. He has a PROVEN pedigree. True Herdsire prospect! Total Shear Weight 14.8 lbs annualized!!! 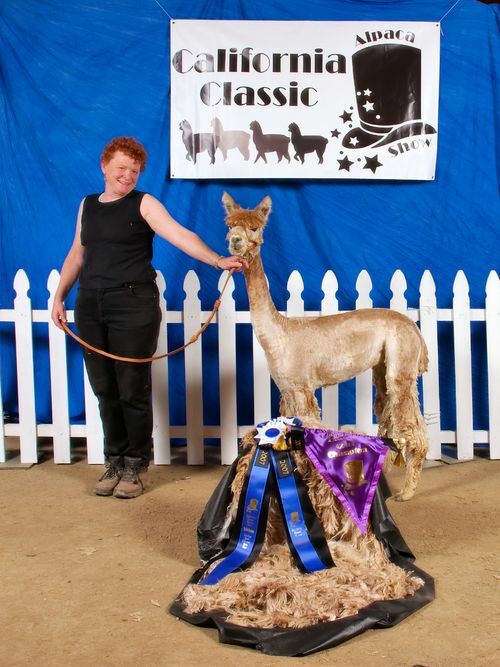 Color Champion California Classic 2008 as a 2 year old, in a prev shorn fleece! !